Figure 1 Examples of grasslands in South Africa (top) and Argentina (bottom). 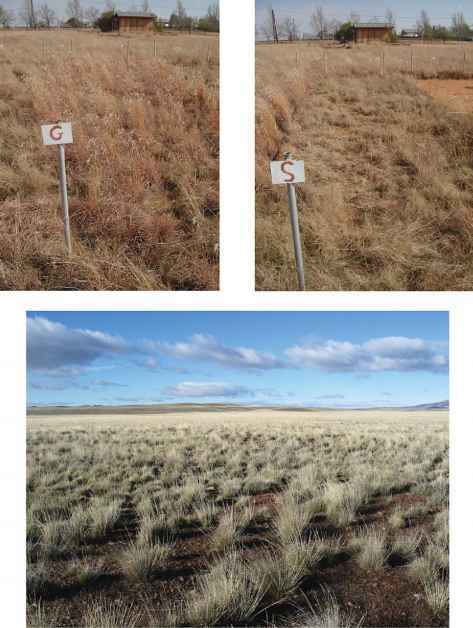 (Top) Experimental plots of a Themeda triandra -Cymbopogon plurinodis grassland located at Bloemfontein, South Africa (28°50' S; 26° 15' E, altitude 1350 m). The left photo shows a nondegraded state dominated by the perennial bunchgrass T. triandra and the right photo shows a degraded plot dominated by the stoloniferous perennial Tragus koelerioides and the short-lived perennial bunchgrass Aristida congesta. (Bottom) View of a grass steppe dominated by Festuca pallescens ('coiron blanco') that characterize the sub-Andean district of the Patagonian Phytogeographic Province located in a narrow north-south strip between 71° W and 71° 30' W. (Top) Thorsten Wiegand. (Bottom) Nestor Fernandez. Hungary, the pampas of Argentina and Uruguay, the steppes of the former Soviet Union, and the plains and prairies of central North America. Grasslands are important ecosystems because they are frequently used for livestock grazing, they provide important ecosystem services, and may serve as carbon sinks. 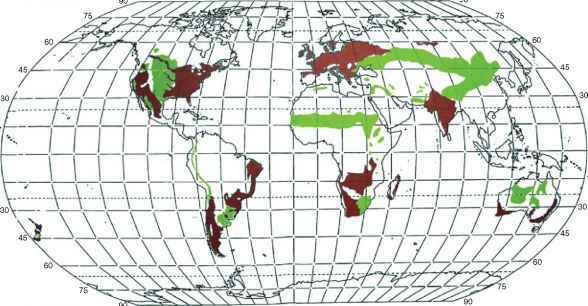 Figure 2 Grassland vegetation map of the world. Green: regions in which grassland without trees is the vegetation climax over most of the area, and brown: man-made grasslands. Adapted from Snaydon RW (1987) Managed Grasslands. Ecosystems of the World, vol. 17B. Amsterdam: Elsevier, and Coupland RT (ed.) (1992) Natural Grasslands. Ecosystems of the World, vol. 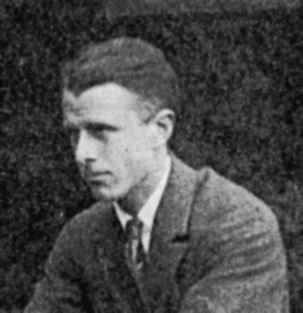 8A. Amsterdam: Elsevier. of pristine climax condition, perennial grasses and sedges are dominant and annual grasses are often restricted to locations where perennial plant cover has been disturbed. On the other hand, in seminatural grasslands, grazing often reduces the palatable perennials which are replaced by unpalatable and/or annual grasses. As one of the world's major ecosystems, grasslands have been an important subject of basic and applied ecological research attempting to understand the ecological processes and factors occurring in grasslands and their effects on grassland dynamics, productivity, and diversity. Grasslands are model ecosystems for basic ecological research to investigate the effects of processes such as competition, seed dispersal, and reproductive strategies on coexistence and diversity. They are of interest in rangeland science where ecological understanding is needed to derive optimal grazing management strategies that maximize fodder or animal production and minimize the risk of degradation. More recently, grassland ecosystems gained interest in climate change ecology because of their importance as carbon sinks.